Located on the north-west coast, Les Landes is a coastal heathland which is heavily fortified and home to probably the most impressive of all naval towers in the Channels Islands, Marine Peilstand 3. High above the 60 meter granite cliffs, it is looking out over sea. A light naval Flak battery gives cover to low flying fighters. 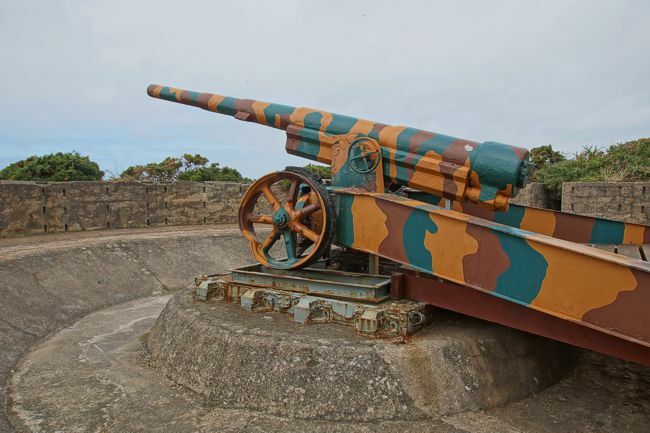 The Marine Batterie Moltke guards this corner of the island with a 15.5 cm K418 (f) battery which was in the process of being converted to a modern 15 cm SK C/28 one. The whole new battery was built except for its fire control post, but the guns were never places. It is a brother of Bt Steinbruch on Guernsey and Bt Annes on Alderney which have about the same layouts and interesting open emplacements for which we still did not find a typenumber. A gun is restored in one of the old emplacements and several bunkers and tunnels are a museum now.